How do I build a very simple android app you ask? It's easy, building a basic android application is not that hard. Making something really useful, cool and bug free, now that takes a good developer. This is a brief tutorial will show you how to code a very basic two button android application (with a start button and a stop button). You can use this code as an android project template or starting point for simple projects. 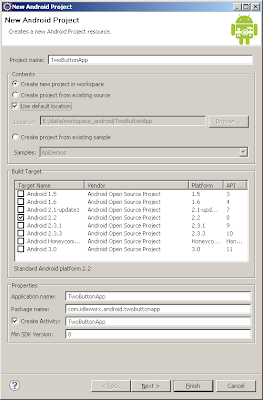 A simple two button application, can be your starting point for various android projects. It can be useful for example when you have an application that starts and stops a service from the click of a button Watch for tutorial on this soon. Note:This tutorial assumes you have completed the HelloWorld Tutorial in the Android docs and you are a little familiar with Eclipse and ADT. The tutorial is aimed at developers who are very new to Android. 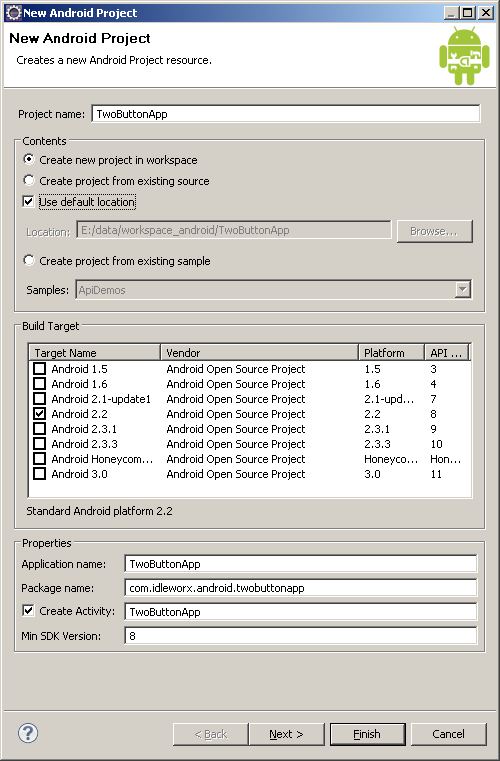 In Eclipse create a new Android project and define the properties as shown below. Feel free to use your own package names. For our main activity we're going to define a very basic layout consisting of one TextView and two Buttons (a start button and a stop button). android:text="This is a simple two button app. \r\n \r\n Tell your user what your app does here \r\n \r\n \r\n \r\n"
In order for the buttons to actually do something useful, and to provide a template for where you can put future functionality, we'll need to define onClickListeners for each button. Each listener displays a simple Toast (a brief message to the user). Not the logtag variable defined in the very top. It's a quick shortcut to save time when logging statements in your app with the Log.X methods. I usually use the same name as the class name and use the Create Filter option in the LogCat view to filter my code out. For easier debugging I've added logging of all the other lifecycle methods in the Activity. When you do debugging of your apps it's very important to understand the lifecycle of an android app, and even more important to see how it's called in relation to your code. So this is it, Introduction to Android 101. You should now have a very basic android app running.